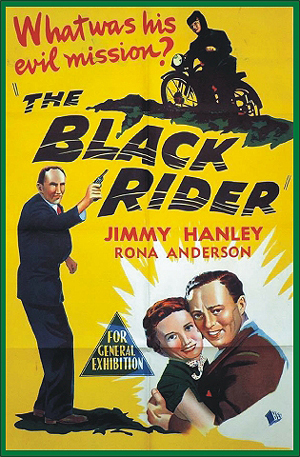 THE BLACK RIDER (1954) Jimmy Hanley, Rona Anderson, Leslie Dwyer, Lionel Jeffries, Vincent Ball. This British B-film crime-quickie has minor elements of both horror and sci-fi. Hanley is an effervescent young reporter who tackles the story of a mysterious, hooded black rider who is seen (on a motorcycle no less) near a crumbling castle on full moon nights. Who is the rider and what is his strange purpose? After much sleuthing, it soon becomes evident that England is faced with a plot so sinister, that the atomic destruction of its cities may result if it the threat isn’t thwarted in time. Anderson, who is cute as a bug, is marvelous as Jimmy’s partner in adventure. Jeffries does his best to give an early Christopher Lee bad guy-type performance. A fun B-thriller. 35mm.